Real talk--my interest in football is pretty much limited to the kind of food that one would eat at a football game (or game day party)...and the occasional super hot football player (um...like this guy). And you know what? I'm totally cool with that. But something that I DO love is any excuse to entertain, and the Super Bowl is one such occasion. 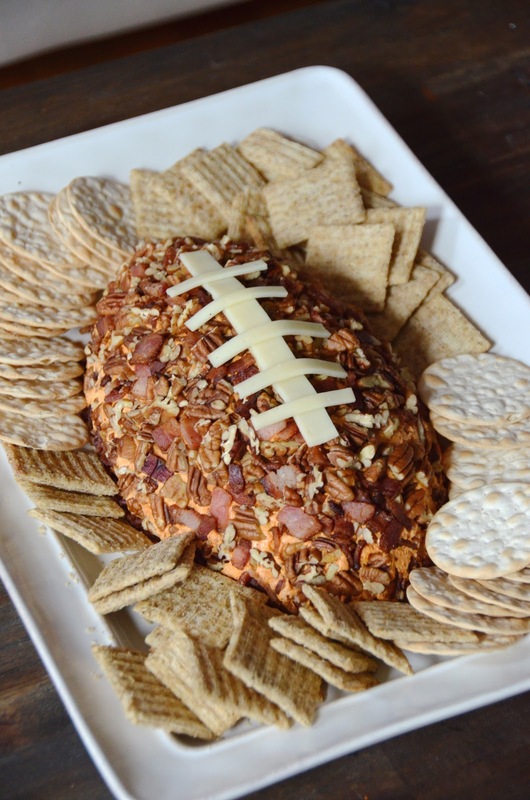 Hence this football cheese ball! 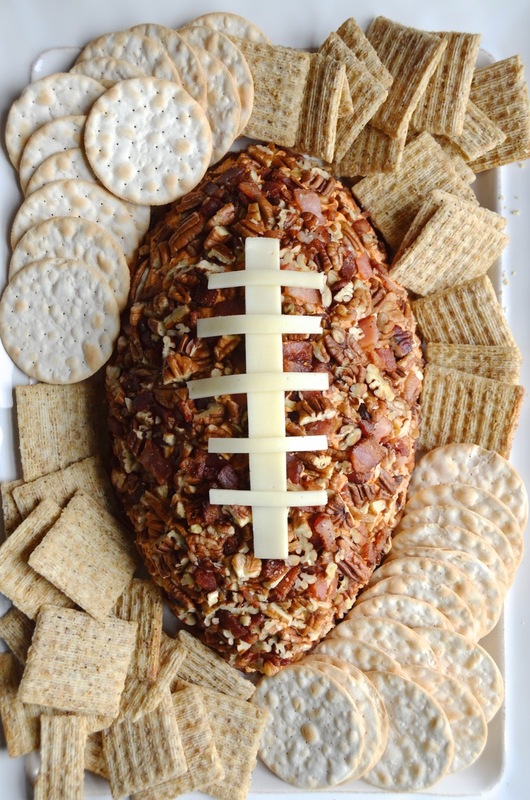 Made with a smokey mix of cream cheese, spices, and shredded cheddar, then topped with crunchy pecans and bacon, it's game day magic! You can make this one a day or two in advance, then just let arm up about an hour before serving (it's better soft so you can spread on crackers or bread). One note about super cute cheese balls like this--people never want to be the first to dig in! So you might have to dig in and get that (foot)ball rolling. In a mixer, combine cream cheese, cheddar, heavy cream, tabasco, paprika, and Worcestershire sauce. Mix well until evenly combined. Scoop mixture onto a serving platter and use clean hands to shape into a football. 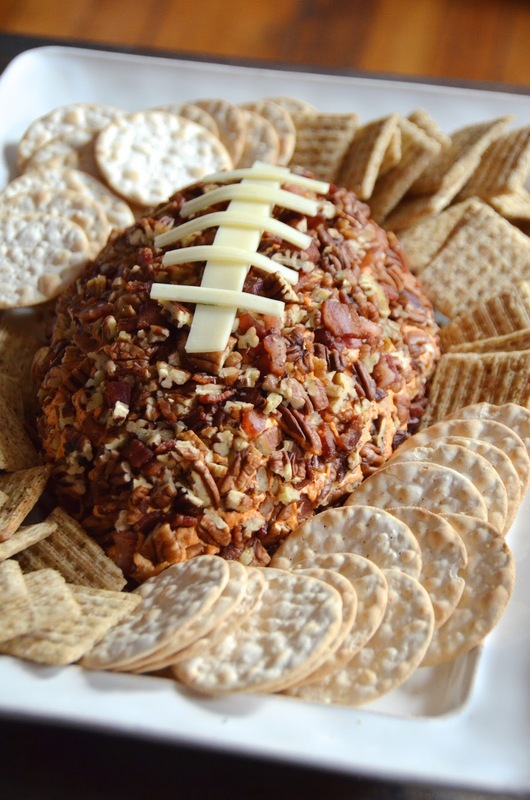 Mix the pecans and bacon, and press into cheeseball to cover completely. Cut cheese slices into 1 long 3/4” thick strip and 5-8 small ones, then arrange on cheeseball to create the laces. Cover with plastic wrap and let chill at least 2 hours before serving with crackers or bread.